It would cap off one of the more incredible comebacks in the history of golf and make no mistake, in-form Aussie professional Andre Stolz has no interest in being at the centre of a Presidents Cup publicity stunt. In a candid interview with Golfer Pacific, Stolz boldly declared he wants to live his golfing dream and earn selection in this year’s International Presidents Cup team to battle the Americans around Royal Melbourne. And the 40-year-old, who has defied a debilitating wrist injury to reignite one of the more colourful and talented careers in the country, is doing everything right to convince Internationals captain Greg Norman to throw up the biggest selection ‘roughie’ in the tournament’s rich 17-year history, if he doesn’t automatically qualify that is. Stolz, hot off a win in the Indonesian PGA Championship in Jakarta, is one of the form players on the OneAsia Tour and boasts an eye-catching record down in Melbourne’s famed sandbelt region, including wins in the Victorian Open and Victorian PGA Championship. 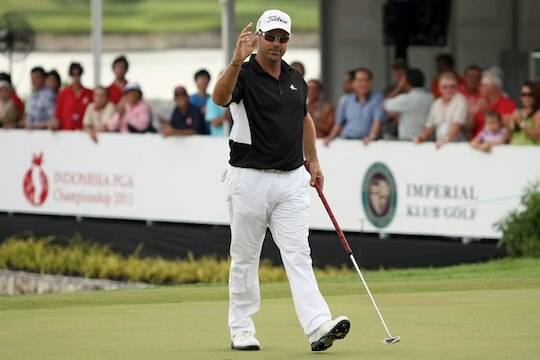 A top-five finish in last year’s JBWere Australian Masters at Victoria Golf Club signalled a return to the big stage for the former US PGA Tour winner, who retired in 2005 after succumbing to a crippling wrist injury. “I haven’t told anyone this yet, but making the Presidents Cup team for Royal Melbourne would be a dream come true,” Stolz told Golfer Pacific. “I’ve had this dream of making the team for quite some time. But I’ll need to win at least a couple more One Asia events and pull off something pretty special elsewhere (to have any chance). “I am trying to qualify by the rankings but obviously if I don’t quite make it that way, it would be nice to be considered (as a Captains Pick),” he said. Stolz, currently 256th in the world rankings (at time of writing), could potentially rocket his way into the top-100 with a couple more wins on the OneAsia Tour, leaving him as an automatic qualifier for the Internationals. While he concedes it’s a long shot, Stolz is riding high on the ecstasy of a successful return to competitive golf and knows all too well how important form and confidence is heading into a big tournament like the Presidents Cup. “I never felt like it was totally my decision to quit playing. It was like someone else told me I had to stop. I never stopped loving the game and I really missed the juices pumping when you’re contending for a tournament,” Stolz said. It’s those competitive juices he hopes can propel him into contention for Norman’s much-anticipated final squad, set to be announced later in the year. In 2009, Norman was widely criticised for his left-field selection of an out-of-sorts Adam Scott alongside Ryo Ishikawa, but with the 2011 event being held in Melbourne, speculation is building the Shark could be hooked on a home-grown talent to help negate the dominant Fred Couples-led US team, who traditionally have found conditions Down Under a challenge in itself. Whether Stolz gets the nod or not, he is just happy to be back playing his best golf after some dark years where swing coaching looked to be his best option to stay in the game. “I didn’t believe my wrist would hold up to full-time golf again so I never thought this would be possible,” Stolz said. While his form back home was nothing short of impressive over the summer, which also included a T3 finish in the Australian PGA Championship, Stolz found it hard to accept any praise. “It was funny at the end of the summer how everyone was congratulating me on a great year. I was so p***ed off because I didn’t win,” he said. And if he misses out on the Presidents Cup? “I wasn’t a very good golfer when I turned pro but I always thought ‘gee it would be great to play the US Masters’,” Stolz said. Greg Norman, you’ve been warned.